It should come as no surprise to learn that I am a theatre buff. Today I face the herculean task of articulating my outrage over the new season, announced at the Sydney Theatre. In Australia. I am spitting mad over the fact that not one, nor two, but THREE amazing shows will be realized in the relatively near future, on the other side of the planet. It's not FAIR. To kick things off, these magnificent bastards are staging Endgame, by Samuel Beckett. 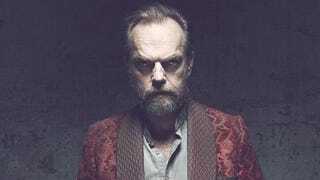 It's one of his strangest, grandest achievements, and it's starring Hugo Weaving. It's about a very bitter O-Decker who can't go to Australia and see any plays. To compound the offense, their second play of the season will be The Present, an adaptation of the original work by Anthon Mother****ing Chekhov. It will star Richard Roxburgh and Cate Blanchett, because life is unfair. At this point in our melodrama, my inner theatre geek— nurtured and made strong on a four year regimen of study at university— is pulling out his hair. His eyes have turned a lovely shade of green, while he gnashes his teeth and begins to froth at the mouth. Finally, to perfect the trans-continental "neener neener neener", the Sydney Theatre is concluding their season with King g*dd*mned Lear, starring Geoffrey Rush. I don't usually wish to succumb to blasphemy like this, but ARE YOU KIDDING ME. COME ON. Geoffrey motherf*cking Rush is going to knock that f*cking role out of the park— to wit, a park (not really it's just a metaphor just go with it okay) I can't visit. Three glorious productions, fulfilling the true splendor of the word 'glorious'. Actors who are beyond reproach, whom I would really, really like to see. Crap. Ya know what? Sydney? I don't want to visit you anyway. The last thing I'd want to do is take in deep lungfuls of that wonderful air, walk your streets, pay custom in your many fine shops. Yes sirree bob, that sounds awful. Feh and poo, Sydney. Australia's lousy with poisonous things anyway. It only makes sense that you would stab me in the heart and fill that wound with bitterness. And also poison. Ouff. I can't. I'mma go and have a think about things. What did I do? What wrong have I committed? I'm just RAMBLING now. I can't.